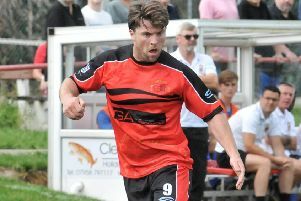 Lancaster City boss Darren Peacock wants his side to finish the season unbeaten in a bid to secure a top-10 spot. The Dolly Blues are 12th in the Evo-Stik First Division North ahead of another busy week that sees them host Droylsden on Saturday before a trip to play-off chasing Spennymoor on Tuesday night. Peacock said: “We can go the rest of the season unbeaten. “We seem to have been in 12th for a long, long time now. “Eighth would be fantastic but it might be a little bit out of our reach. A win over Droylsden would draw City level with the side currently occupying 10th spot while Spennymoor sit in the final play-off position. Peacock said: “Droylsden score a lot of goals but we should have beaten them at their place earlier in the season. “Then Spennymoor are probably the best team we’ve come up against this season. City enter another busy week on the back of picking up four points out of six over the Easter weekend with a fine 4-1 win over Mossley coming before a goalless draw in the derby at Kendal Town. Peacock said: “Going into it we would have been happy with four points. “But after Monday’s game we were disappointed we didn’t have all six. “A clean sheet is a positive against a side that score a lot of goals but they also concede plenty too. The jackpot for the Lancaster Guardian-sponsored Treasure Chest stands at £300 for the game against Droylsden. Tickets for the half-time draw cost £1.